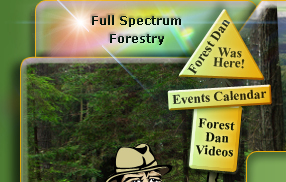 ﻿ Welcome to Forest Dan and Full Spectrum Forestry! Forest Dan is that character from Oregon, who lives and breathes Oregon forests as well as anywhere else they grow. He takes the view of both the tree hugger and tree whacker, realizing that they are the same. Since we are all citizens, we are all part of the great consumption of the planet’s resources, and generally just arguing details. So we must realize that wise use of resources by everyone and good stewardship of the forests by those whose job it is to manage them, will benefit everyone. Let’s not shout from opposite sides of the field, let’s get out there and play! Each day all of us vote to cut trees to supply us with so much, as we use paper and live in our wooden houses. Every Tree Hugger is a Tree Whacker and visa versa. What can Forest Dan do? Spread the word of good stewardship and citizenship while bringing the wonders of the forest to everyone.